Your home relies on heating and cooling systems to make your life more comfortable and convenient. A good heating system is vital in the winter when the temperatures drop. An efficiently operating air conditioning system is a priority when our temperatures heat up. You rely on the safe and seamless operation of these systems and when they break down, not only is your comfort at risk, but your time and money. At Champion AC & Heating Repair we realize that not only is a malfunctioning furnace or air conditioning system an inconvenience but often, it is a confusing time of not knowing who to trust for repairs. Having a professional contractor that you can put your trust in at moments like these is indispensable. As an industry leader, we understand. We have a wealth of knowledge and are ready to answer your questions with patience. 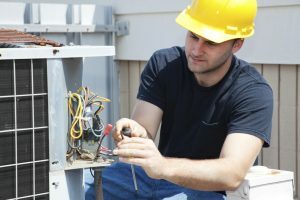 We offer comprehensive service and vast experience with all makes and models of air conditioning systems and furnaces. Our expert technicians are ready to ensure that your heating and cooling systems continue serving you well long after we leave. We have served families in the King City, Aurora, Georgina, and Stouffville, Ontario for years and look forward to serving yours. When you call us, we will send one of our seasoned technicians to your home to conduct a comprehensive inspection. Furnaces and cooling systems have a life expectancy and often it is subject to regular, proper maintenance of those systems. Furnaces and air conditioning components that are old, dirty or in disrepair are not working optimally and will be a drain on your comfort and pocket. Systems that have not been maintained properly can also pose health and danger risks. We take your comfort and safety seriously. We will make recommendations considering the age and condition of your furnace or air conditioning system. We pride ourselves on saving our customers the cost of replacing entire systems whenever repairs are warranted and we have the experience to work on most makes and models. If repair is feasible and practical, we will make that recommendation. If replacement makes more sense, we will make recommendations considering your situation, your home’s layout and your budget. We want to deserve your business so we will become your trusted experts in the future as well as the moment. Long term business relationships are something we believe in. At Champion AC & Heating Repair, we take our reputation seriously. We only hire industry professionals with multiple years of experience. When one of our professionals rings your doorbell, you can rest assured that technician knows his stuff. Our technicians have demonstrated working knowledge of not only air conditioning and furnace repair, maintenance and replacement, but also zone controlled systems, water heater repair, duct repair and replacement, thermostats, and fireplace repair. When you call us, you get a qualified technician who can assist with all aspects of your heating and cooling comfort. We are truly a one stop shop. If your system has reached the end of its life expectancy, we can give you advice on the products available in the marketplace and their pros and cons. We would also be delighted to set up a regular maintenance schedule and walk you through our process so you become an educated consumer. We feel the more educated our customers are, the easier it makes our job. A heating or cooling system should be maintained and serviced at least annually, but often, it is the least convenient times when these trusted devices break down. If our customers know what symptoms to look for, they will be more likely to call for service before it becomes a huge problem. 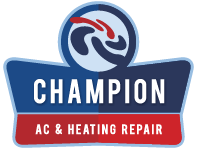 No matter what your air conditioning or heating needs are, Champion AC & Heating Repair is available to make sure they are met. Whether a minor repair or an expert installation, maintenance or trusted advice, we can assist you with a solution that fits your particular situation. Out reputation is built on your complete satisfaction. If you have questions, we have answers. If you are concerned, we will attempt to ease your concerns with as much information as you require. We want you to have complete peace of mind when you choose us to take care of the heating and air conditioning needs in your home. And we want your experience with us to be one that will create a trusted business relationship for years to come. Call Champion AC & Heating Repair today to schedule an appointment with one of our heating and cooling experts. We are honored you have chosen us and will not disappoint you. We want to serve you with 100% satisfaction, so we will become your long term trusted experts. Long term relationships is something we believe in.